Most 10-year-olds spend their day focusing on friends, video games, or organized sports; however, Gabe Henry is not your typical 10-year-old. 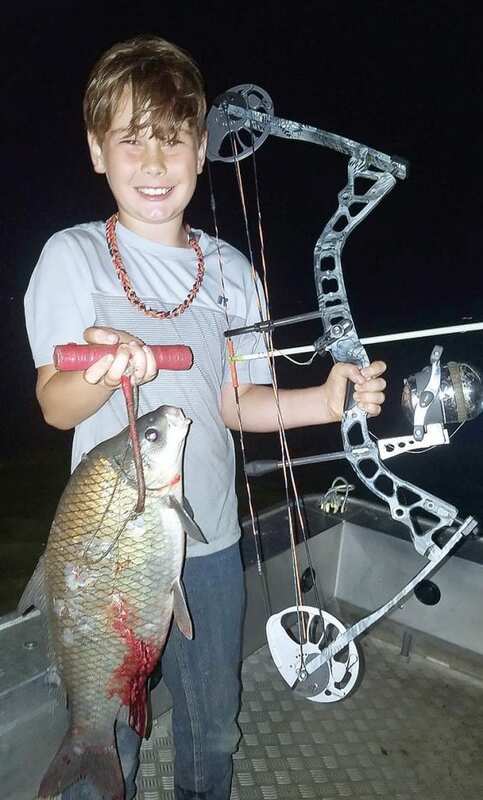 Henry, who began the sport of bow fishing in May 2018, has already set three state records, one world record, and has his sights set on more records. On Sept. 7, Henry set his first state record. He bagged a 5.1 pound small mouth buffalo, which, to a novice, is often mistaken as a carp. The small mouth buffalo differs from the common carp in that they do not have whisker-like sensory organs, known as barbels, near the mouth. While bow fishing in the Lake Wilson area, and just one month after setting the first record, Henry broke his own record on Oct. 6 with a 5.9-pound small mouth buffalo catch. The records did not stop there. On Dec. 16, which happened to be Henry’s 10th birthday, he not only set a state record for the common carp (15.8 pounds), but he also set a world record for the small mouth buffalo with a 34.4 pound catch. This shattered the previous world record of 17.9 pounds set in Missouri on May 4, 2018. Bow fishing has many aspects that have to be considered when heading out on the water. A bow fisherman must consider movement of the water, the depth, other water conditions, and the point of aim. Bow fishers are only allowed to shoot species that are referred to as trash fish or garbage fish, such as carp, gar, freshwater drum, and yes, even catfish. Trash fish are defined as rubbish and not usually considered edible. While Henry may see plenty of fish on an outing, he has perfected his shot and primarily does what is referred to as selective shooting. This means he doesn’t shoot at every fish that swims within his target area. He chooses which fish he wants. He admits he is looking for fish that could possibly land him another record. Henry has developed a long-term plan in working towards a future goal of becoming a bow-fishing guide. At the age of 18, he plans to obtain his U.S. Coast Guard captain’s license and put that dream in place. But for now, Henry will continue to perfect his game as he works on setting more state and world records.